Enter the next dimension in embossing! Our 3-D Textured Impressions Embossing Folders offer the deepest and boldest dimensional embossing experience with a truly striking visual element. Turn ordinary cardstock, paper, metallic foil or vellum into an embossed, textured masterpiece. Sizzix 3-D Textured Impressions Embossing Folders are for use with the BIGkick, Big Shot and Vagabond machines only (used with a single Cutting Pad and the machine's included Platform). For best results, spray fine water mist onto material before use. 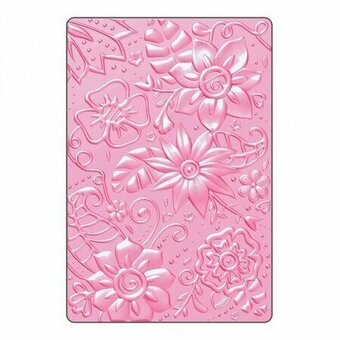 This package contains one 4.5x6.5x.125 inch 3D embossing folder. 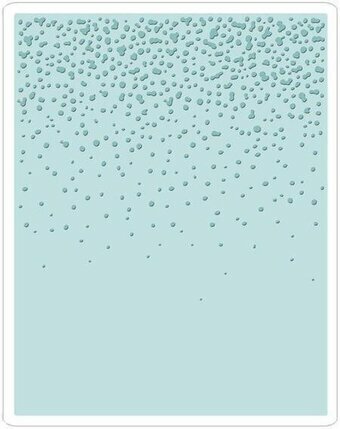 An Impresslits Embossing Folder combines die-cutting and embossing into one easy step. This unique process uses a cutting edge from a chemically etched wafer-thin die embedded into a plastic embossing folder to create a die-cut with elegant dimension from paper, cardstock, vellum and metallic foil. Each design includes stylish sentiments and fits the exact dimensions of an A2 card. These beautiful designs are ideal for shaker cards, banners and photo cards. This embossing folder is designed for use with the BIGkick, Big Shot and Vagabond machines (with a pair of Cutting Pads and the machine's included Platform). All items sold separately. Distress to impress! Texture Fades Embossing Folders easily emboss in such a way that select areas of the image appear perfectly faded and distressed. Turn ordinary cardstock, paper, metallic foil or vellum into an embossed, textured masterpiece. Texture Fades Embossing Folders are for use with the Texture Boutique, BIGkick, Big Shot and Vagabond machines only (used with a pair of Cutting Pads and the machine's included Platform). Distress to impress! Texture Fades Embossing Folders easily emboss in such a way that select areas of the image appear perfectly faded and distressed. Turn ordinary cardstock, paper, metallic foil or vellum into an embossed, textured masterpiece. Texture Fades Embossing Folders are for use with the Texture Boutique, BIGkick, Big Shot and Vagabond machines only (used with a pair of Cutting Pads and the machine's included Platform). 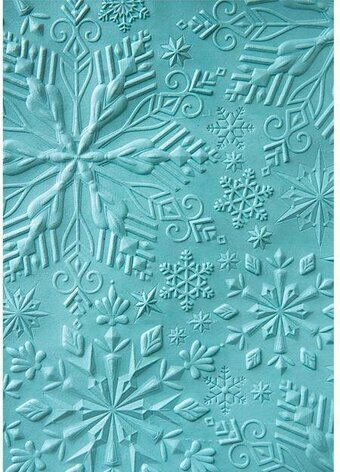 5 3/4" x 4 1/2"
Enter the next dimension in embossing! Our 3-D Textured Impressions Embossing Folders offer the deepest and boldest dimensional embossing experience with a truly striking visual element. Turn ordinary cardstock, paper, metallic foil or vellum into an embossed, textured masterpiece. Sizzix 3-D Textured Impressions Embossing Folders are for use with the BIGkick, Big Shot and Vagabond machines only (used with a single Cutting Pad and the machine's included Platform). For best results, spray fine water mist onto both sides of material before use and pass the folder through your machine three times. Please note that cardstock must be dry before embellishing with ink. Sizzix 3-D Impresslits Embossing Folders cut and emboss or deboss 3-D embellishments in just one fun and easy step. Simply crank the folder with the accompanying material (paper, cardstock, vellum or metallic foil) through the Sizzix BIGkick, Big Shot or Vagabond machine (with one Cutting Pad and the machine's included Platform) and a fully cut-and-embossed shape magically appears in high-definition 3-D detail-making any papercrafting project pop with possibilities! Features a hot air balloon, "Adventure Awaits", and "Happy Birthday". An Impresslits Embossing Folder combines die-cutting and embossing into one easy step. This unique process uses a cutting edge from a chemically etched wafer-thin die embedded into a plastic embossing folder to create a die-cut with elegant dimension from paper, cardstock, vellum and metallic foil. Each design includes stylish sentiments and fits the exact dimensions of an A2 card. These beautiful designs are ideal for shaker cards, banners and photo cards. Features flowers and the sentiment "Made with Love". An Impresslits Embossing Folder combines die-cutting and embossing into one easy step. This unique process uses a cutting edge from a chemically etched wafer-thin die embedded into a plastic embossing folder to create a die-cut with elegant dimension from paper, cardstock, vellum and metallic foil. Each design includes stylish sentiments and fits the exact dimensions of an A2 card. These beautiful designs are ideal for shaker cards, banners and photo cards. Enter the next dimension in embossing! Our 3-D Texture Fades Embossing Folders offer the deepest and boldest dimensional embossing experience with a truly striking visual element. Turn ordinary cardstock, paper, metallic foil or vellum into an embossed, textured masterpiece. Sizzix 3-D Texture Fades Embossing Folders are for use with the BIGkick, Big Shot and Vagabond machines only (used with a single Cutting Pad and the machine's included Platform). For best results, spray fine water mist onto material before use. Create a big impression! 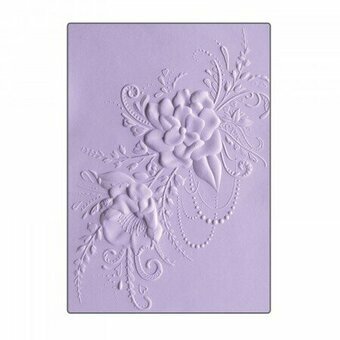 Textured Impressions Embossing Folders offer the deepest and boldest embossing experience. Turn ordinary cardstock, paper, metallic foil or vellum into an embossed, textured masterpiece. Textured Impressions Embossing Folders are for use with the Texture Boutique, BIGkick, Big Shot and Vagabond machines only (used with a pair of Cutting Pads and the machine's included Platform). Sizzix Textured Impressions Embossing Folders 5PK - Sending Christmas Love Set. This set of Embossing Folders showcases the fanciful style of Ellison die artist Rachael Bright. It contains one large folder, measuring 5 3/4" x 4 1/2" x 1/8", and four small folders, each measuring 2 7/8" x 2 1/4" x 1/8". 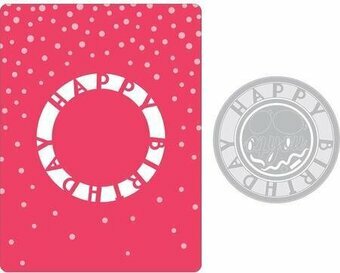 The large folder also fits the exact dimensions of an A2 card, while the small sizes create amazing embellishments. Textured Impressions Embossing Folders are for use with the Texture Boutique, BIGkick, Big Shot and Vagabond machines only (used with a pair of Cutting Pads and the machine's included Platform). This Textured Impressions Embossing Folders Set includes these five folder designs: Christmas Tree #6 (Small); Elf Legs (Small); Phrase, Sending Christmas Love (Small); Reindeer Antlers (Small); Penguin & Christmas Tree (A2 Large). 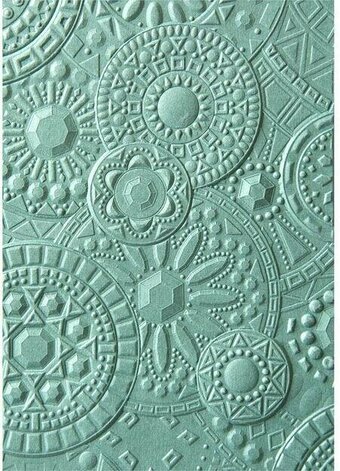 This pair of Embossing Pads was specially designed for use in the Texture Boutique machine. Constructed of durable PVC plastic, these Embossing Pads allow for easy embossing of Textured Impressions, Texture Fades and Texture Trades in the Texture Boutique machine. Simply sandwich the embossing folder and material to be embossed between the Embossing Pads and roll through the machine. Each Embossing Pad measures 4 7/8" x 7" x 1/8" and lasts for thousands of impressions. These pads precisely compensate for the proper pressure and height required for pressing thin material surfaces such as paper, cardstock and foil to make a lasting impression. The diagrams on the Embossing Pads offer easy guidelines about how to make the perfect Sizzix sandwich. If necessary, use the included Mylar Shim for deeper, more complete embossing. When the Embossing Pads are worn out, it is time for replacement Embossing Pads. 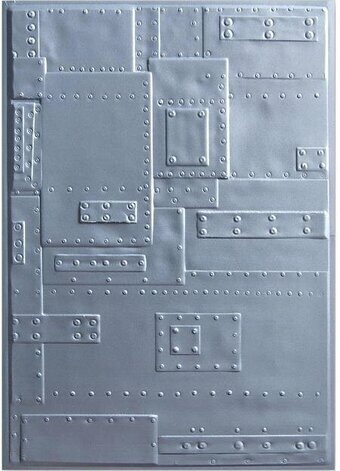 Background embossing folder from Tim Holtz. Distress to impress! Texture Fades Embossing Folders easily emboss in such a way that select areas of the image appear perfectly faded and distressed. Turn ordinary cardstock, paper, metallic foil or vellum into an embossed, textured masterpiece. Christmas themed embossing folder from Tim Holtz and Sizzix featuring Poinsettia flowers. This Embossing Folder showcases the inspired style of Jillibean Soup. The large A6 folder measures 6 1/2" x 4 1/2" x 1/8". Textured Impressions Embossing Folders are for use with the Texture Boutique, BIGkick, Big Shot and Vagabond machines only (used with a pair of Cutting Pads and the machine's included Platform). This Textured Impressions Embossing Folders Set includes these folder designs: Daisy Chain #3 (A2 Border); Dots #8 (A2 Border); Flowers #14 (A2 Border). Used with the machine's included platform in a Sizzix BIGkick, Big Shot and Vagabond Machines, an Impressions Pad* is a durable embossing accessory made specifically for Sizzix Texturz Plates and Silicone Rubber (all items sold separately). 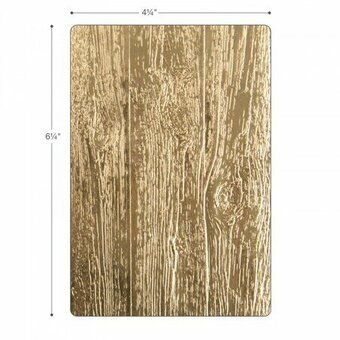 This pad measures 8 7/8" x 5 7/8" x 1/8" and precisely compensates for the proper pressure and height required for pressing thin material surfaces such as paper, cardstock and foil to make a lasting impression. For added versatility, use Impressions Pad and Silicone Rubber to emboss with any metal stencil. Create an even bigger impression! Textured Impressions Plus Embossing Folders offer the deepest and boldest embossing experience. You can turn ordinary cardstock, paper, metallic foil or vellum into an embossed, textured masterpiece. Textured Impressions Plus Embossing Folders are for use with the Big Shot Plus and Big Shot Pro machines (used with a pair of Cutting Pads and the machine's Platform System). All items sold separately. This set of Embossing Folders showcases the fanciful style of Ellison die artist Rachael Bright. It contains two large A2 folders, measuring 5 3/4" x 4 1/2" x 1/8". Textured Impressions Embossing Folders are for use with the Texture Boutique, BIGkick, Big Shot and Vagabond machines only (used with a pair of Cutting Pads and the machine's included Platform). This Textured Impressions Embossing Folders Set includes these two folder designs: Bohemian Lace (A2 Large); Rolling Stone Blooms (A2 Large). An Impresslits Embossing Folder combines die-cutting and embossing into one easy step. This unique process uses a cutting edge from a chemically etched wafer-thin die embedded into a plastic embossing folder to create a die-cut with elegant dimension from paper, cardstock, vellum and metallic foil. Each design includes stylish sentiments and fits the exact dimensions of an A2 card. These beautiful designs are ideal for shaker cards, banners and photo cards. This embossing folder is designed for use with the BIGkick, Big Shot and Vagabond machines (with a pair of Cutting Pads and the machine's included Platform). All items sold separately.